Looking for gorgeous bedroom design ideas? Designing your bedroom well is crucial to creating a space that meets all of your needs. A tall headboard, soft carpet, and an abundance of cushions all contribute to creating a perfect bedroom. Choosing the right paint colour and bedroom lighting scheme is also essential to getting the look and atmosphere of your bedroom just right. Don't forget about clever bedroom storage, too, to keep your bedroom serene and clutter-free. We've picked our top new bedroom design ideas, from soft cushions to statement headboards, to inspire you to refresh your bedroom. Check out our ultimate guide to designing your bedroom, too, to get your room transformation just right. A well-planned bedroom lighting scheme can change the entire ambiance of your room. Choose different lights for different activities – a bright pendant light for practical tasks, a table lamp for reading, or make a statement with a floor lamp. This can be placed behind an armchair for a cosy reading spot, or in a dark corner to brighten the space. Check out these bedroom lighting ideas for more inspiration. Embrace bold and bright bedroom paint colours by using blocks of the same shade throughout your space. This works best with contrasting colours, such as blue and yellow, green and pink, red and blue, or any combination that you love. Discover more colour blocking inspiration for your bedroom. The Audrey Double Upholstered Bed in Canary stands out against the cobalt blue walls, creating a striking bedroom centre piece. For a similar blue paint colour, try Pitch Blue from Farrow & Ball. A wardrobe is a key focal point in your bedroom. It's a good idea to consider exactly how much bedroom storage space you need. A wooden wardrobe is timeless and can sit back in any scheme. A mirrored wardrobe will visually enhance the size of your bedroom – and look smart, too. Choose wardrobes with space-saving sliding doors if you have a small bedroom; get ideas for walk-in wardrobes and dressing rooms if you have more space. We are of course lovers of the humble Ikea Pax wardrobes, seen below with simple grey-green doors and bang on-trend leather handles. Curtains and shutters or blinds are essential in any bedroom – but window film, which will give you some privacy without excluding natural light – is a good budget option to match with curtains. We like this functional and pretty window film design from The Window Film Company. Its pattern is discreet enough not to disrupt a bedroom design scheme, but it will also add interest to your window. Find more smart bedroom window treatments in our guide. Soft furnishings are a great way of creating a new look in your bedroom, since they can be easily swapped for something different next season. For an opulent, headily romantic look, try cushions and throws in an elaborate, oriental print. Combine with distressed walls for a contemporary edge. We love the outrageously luxurious Oriental Botanica Velvet Cushions in Pewter Grey from The French Bedroom Co. Plain wooden bed frame? So over. To inject your bedroom with an element of fun and novelty, choose a shapely, upholstered or painted headboard that co-ordinates with other elements in your bedroom. Need more storage but want to keep it subtle? Choose a storage headboard. Our favourite is the Ariel Upholstered Bed from Sweetpea & Willow. Its seashell-shaped headboard is right on the mermaid trend, without looking childish, and the delicate blue colour will look great in most bedrooms. The botanical wallpaper and grey bedroom trends are still going strong – floral and plant patterns add interest to any room, and there is a wide choice of styles out there to suit all tastes, while grey bedroom schemes can be both restful and welcoming. Go for a bold, tropical pattern for an opulent boudoir effect, or choose a more delicate, muted design for a more subtle look. Our pick is the dreamy, Japanese-inspired Classic Hua Trees Mural Wallpaper from Sian Zeng. Find more gorgeous wall mural design ideas in our inspiring gallery. Ditch bulky, boxy wooden bedside tables for a streamlined, metal unit that will instantly modernise the look of your bedroom. Choose one that offers plenty of storage, too. Combine your industrial-style unit with mellow, neutral soft furnishings for a pleasing contrast. Our pick is the robust and striking Industrial Style Bedside Table from Cox & Cox. An ottoman or bench can transform your bedroom into a more sociable space – use as an extra seat, or a coffee table for an indulgent breakfast in bed. Bedroom storage and bedroom furniture in one, what's not to love? The Linen Look Blanket Box from Angel & Boho is roomy and has a lovely, smooth finish. For an instant and quick update, bold, colourful bedding can transform the look of your space. Swap your plain white bedlinen for something that will make a bit more of a statement; we recommend sticking to just one colour, though, if it's especially bright. We like the Lazy Linen in Kingfisher from Loaf but you well find plenty more beautiful bedding in our bedlinen design ideas feature. Of course, we all love the soft feel of carpet beneath our feet in the middle of a cold night when we stumble to the loo, but it's not always practical and, well, some of us just love a hard flooring. Whatever flooring type you choose, look for one with a textured look for added interest and in a light colour to make the bedroom feel larger. And, of course, you can always add a rug (see below). For more bedroom flooring advice, see our practical guide. Neutral colours will always work for bedroom rugs – but if you are feeling a bit more adventurous, choose one with a bold pattern or in a bright colour. Then accent the rest of the room with bedlinen and furniture in similar colours; you don't need to match the shade exactly, but it's a good idea to tick to one main colour and explore different tones. While you might shrink from putting a wallpaper downstairs, you can really indulge in your love of pattern in a bedroom. Picking one with a light background will make the bedroom feel larger, while any vertical stripes (like these below) will make the room feel taller. 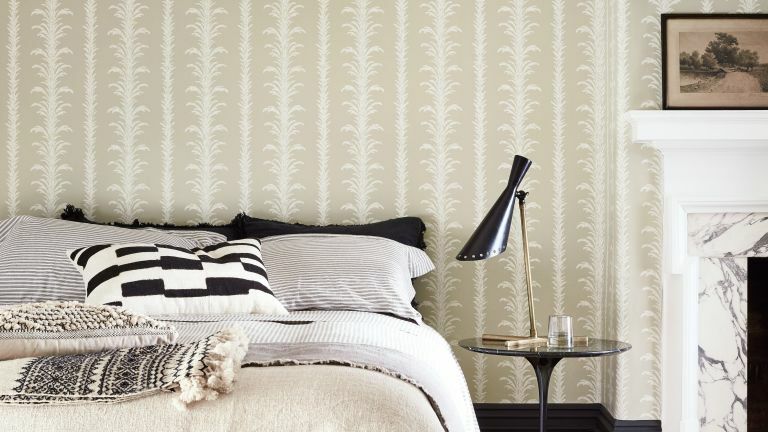 See more bedroom wallpaper ideas in our guide.